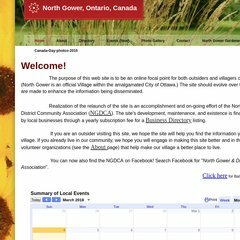 Topics: North Gower, Ontario, Canada, Events, & Ngdca. Its 3 nameservers are ns12.primus.ca, ns10.primus.ca, & ns11.primus.ca. Northgower.ca's IP address is 184.72.229.176. It is hosted by Amazon.com Inc (Virginia, Ashburn,) using nginx web server. A ping speed test response, is timed at 27.0 ms.